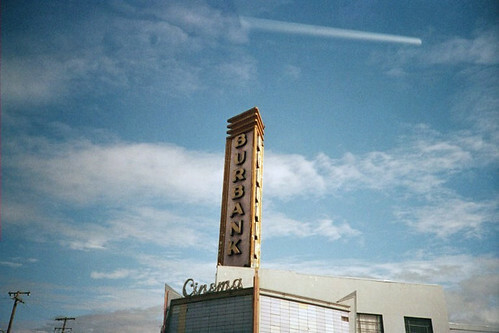 This is the Burbank theater. It no longer shows movies (the last few years before it closed, it showed 'adult' movies). It's next door to a scuba gear shop, which is next door to the camera shop where I bought my Pentax K1000. I drive by this theater on my way to the record store. In fact, I was probably on my way to the record store when I took this photo. I used to be able to see this sign from the freeway, at night, when it was lit up. But that was almost 20 years ago. I hope they don't tear it down, because I think the sign looks kind of neat, even when it's not lit up. But I will not be surprised if I drive by one day and there's a starbucks in it's place. \n\n\nBecause I have nothing else to tell you, I will tell you about this photo...\n\nThis is the Burbank theater. It no longer shows movies (the last few years before it closed, it showed 'adult' movies). It's next door to a scuba gear shop, which is next door to the camera shop where I bought my Pentax K1000. I drive by this theater on my way to the record store. In fact, I was probably on my way to the record store when I took this photo. I used to be able to see this sign from the freeway, at night, when it was lit up. But that was almost 20 years ago. I hope they don't tear it down, because I think the sign looks kind of neat, even when it's not lit up. But I will not be surprised if I drive by one day and there's a starbucks in it's place.